Easy and efficient: "Convenient electric starting, with an automatic internal-decompression system, gets you going quickly and easily. Programmed Fuel Injection (PGM-FI) system improves power delivery and throttle response, and increases fuel efficiency for extended range. " Dual-Clutch Transmission: Automatic Dual-Clutch Transmission (DCT) provides the compact size and strength of a manual transmission with the convenience of an automatic transmission (plus no belts to slip, break or burn out). DCT features a dual-shift mapping program that automatically selects between two transmission shifting modes—either Cruise or Sport—for optimum shift timing depending on the rider's pattern of throttle operation. During aggressive use, the Sport mode kicks in and holds the transmission in gear longer before shifting to deliver more aggressive performance. During more relaxed operation, the Cruise mode allows the transmission to shift up sooner for more casual performance and enhanced fuel efficiency. In addition to the fully automatic mode, the DCT transmission also allows riders to employ Honda's exclusive Electric Shift Program (ESP) for easy shifts with the touch of handlebar-mounted buttons. Dual-range sub transmission allows you to easily select between high and low range via a conveniently placed lever. The 5-speed Dual Clutch Transmission will operate fully within either range, ensuring that you can always select the correct ratio for the conditions. One-handed reverse shift mechanism allows you to select reverse without ever taking your hand from the handlebars. Tackle any terrain: " 2WD/4WD system offers three drive modes: 2WD; 4WD with torque-sensing front differential; and 4WD with locked front differential to optimize traction. 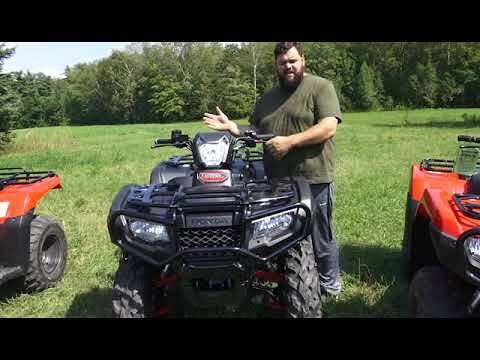 The system also features a Speed Override mode that can be engaged when the front differential is locked to allow increased wheel speed under severe conditions, such as deep mud. " Quiet operation, long-lasting performance: A sub-chamber in the air cleaner reduces resonant noise for quieter operation. 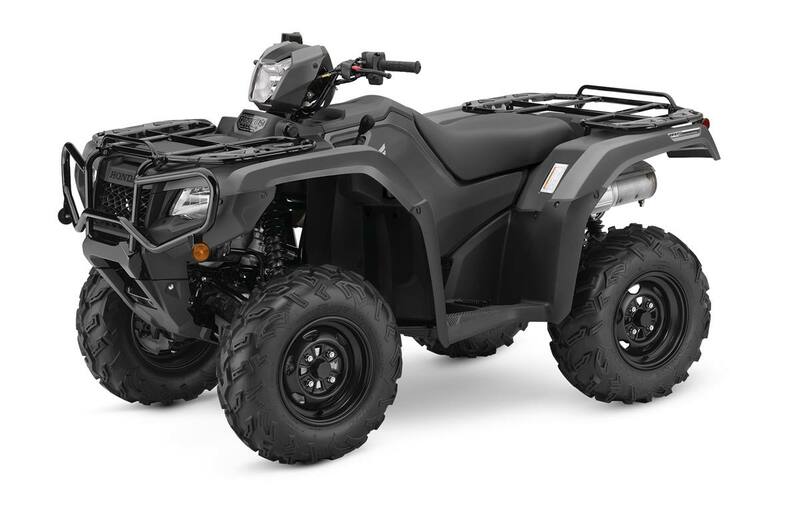 Stainless-steel exhaust system includes a USDA-qualified spark arrester/muffler designed for quiet operation without servicing for long-lasting performance. Proven power steering: This latest iteration of Honda's proven Electric Power Steering System (EPS) features even lighter steering effort and reduced kickback for enhanced comfort while maintaining a strong feeling of control. Excellent stopping power: Inboard rear disc brake is mounted on the rear driveshaft, reducing unsprung weight and keeping the disc out of harm's way in rugged conditions. Dual front hydraulic disc brakes with large 190 mm rotors provide strong stopping power. The brake calipers feature a built-in scraper system that removes mud and snow from inside the front wheel to help prevent build-up of debris between caliper and rim for consistent braking performance. High quality: Plastic CV joint boots on the front driveshafts are durable and tear-resistant. Plus, sealed steering-knuckle bearings for extended durability. Strong visibility: Twin-headlight system features 35-watt headlights with focused light distribution for improved visibility after dark. Top assist 50-watt light operates independently of front headlights, allowing it to be turned off while carrying a load on the front carrier. Rugged design, convenient access: Bold bodywork offers excellent mud and debris protection. Clever one-piece tank/side cover design requires no tools for removal, providing quick access for maintenance. Intuitive display: Full-function instrumentation gives the dash a modern look while providing information at a glance. The display includes speed, odometer, trip meter, fuel gauge, coolant temperature, clock, gear position indicator, 4WD indicator and even a Maintenance Minder system that notifies when it's time for service. Purpose built: All-steel full-sized front bumper wraps around the headlights, improving protection and adding to the Rubicon's aggressive appearance. The bumper also features an integrated mount for an accessory winch. Cargo ready: Front and rear steel-tube carriers feature large steel plates and additional tie-down points for improved load security. Load capacity for the large front and rear carriers is 45 kg (99 lbs.) and 85 kg (187 lbs.) respectively. Powerful towing: Heavy-duty trailer hitch with 600 kg (1,322 lbs.) towing capacity. Multi-functional: A host of optional accessories allow you to tailor your Rubicon to your needs.